I’m sure there is list somewhere ‘The Most Iconic Films from the 90s Films’. I’m extra sure Pretty Woman is included in that list. Released in 1990, the romantic comedy Pretty Woman sky-rocketed Julia Roberts to the height of fame. Her gorgeous curly red-brown hair, sassy attitude, lovable character and amazing outfits, captured everyone’s hearts. The storyline of a high class business man falling for a prostitute turned out to be the perfect love story. While I could go on all day about the storyline, brilliant soundtrack and cast, it’s the clothes we’re all still talking about. This stunning floor length gown that Vivian wore to the opera was truly spectacular. Everyone remembers those white gloves and the quarter of a million heart necklace that was ‘only on loan’. The off-shoulder detailing is timeless and elegant, with a hair do to match. 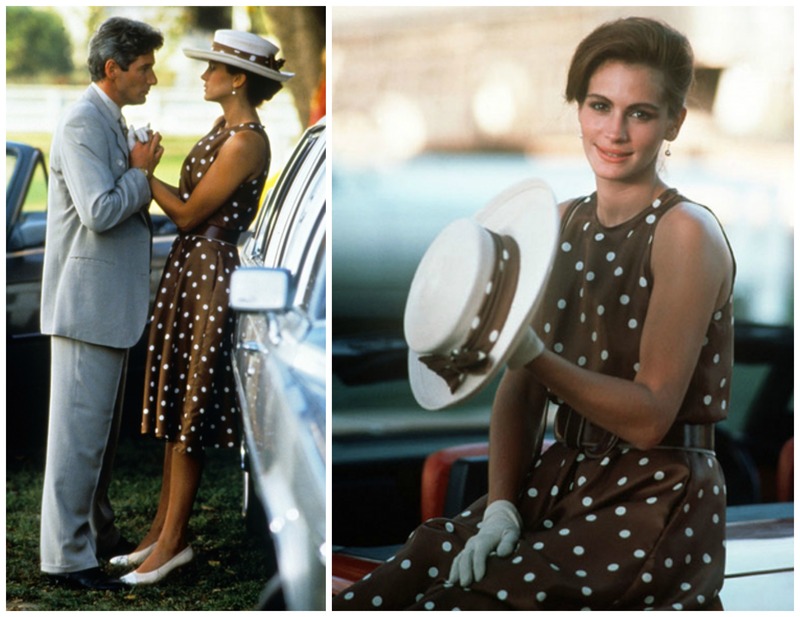 I love, love, love this brown and white polka dot dress. It is my favourite outfit from the whole film! The dress is beautifully accessorised with a white hat, trimmed with the same material as the dress, white gloves and shoes and a large statement belt to add shape. I wonder how many people have recreated this look at polo matches? Famous the world over, this cut out blue and white dress was used in numerous scenes throughout the film. When Edward picks up Vivian, when she goes shopping on Rodeo Drive and when she spends the night in the Beverly Wilshire. Styled with black leather knee high boots, a rather nice red coat with black trim and a white men’s shirt, this is one for the fashion history books. The quality of these pictures definitely do not do justice to these dresses. Vivian wore a white button down dress with black hat and, of course, white gloves, after shopping on Rodeo Drive. Carrying a small black handbag and loads of clothes, everyone remembers this as the ‘Big mistake…Huge!’ scene dress. To dine with Edward and his potential clients Vivian wore a black lace dress, choker and black gloves. Very classy! If you haven’t seen the film yet I highly recommend it… for the fashion alone. It is superb! Let me know your favourite looks from the film too. This entry was posted in Fashion and tagged black cocktail dress, blue and white dress, famous fashion, Fashion, Iconic Films, Julia Roberts, polka dot dress, Pretty Woman, Pretty Woman brown polo dress, Pretty Woman Fashion, red dress, red opera dress, Richard Gere, white gloves, white shopping dress. Bookmark the permalink. The costumes within the course of this film are timeless and I still adore that dotted brown dress and of course, the red dress! I will wear a similar dress tomorrow on a ball and I can’t wait – in terms of fashion this film definitely is a masterpiece. But as you have written before, also the lovestory is very beautiful and romantic. Pretty woman red dress so cute, fabulous, with Julia Roberts wearing it, it is looking so beautiful.